The Discovery Institute's discovery was discovered in the remote Dusty Rivers area of southwestern Arizona. A spokesman for the paleontological team said that the dinosaur saddle provides irrefutable proof that man and dinosaurs lived simultaneously, as predicted by most creationist or "intelligent design" doctrines. "I can't tell you how thrilled we all were to stumble upon this groundbreaking historical find," said Dr. K. Firth Booble, leader of the expedition. "We knew there had to be some evidence for man-dinosaur concurrence buried somewhere around here, but didn't think we'd discover it so quickly." Dr. Booble, who received his doctorate in paleontology from the respected Holy Patriot!™ Bible University and Correspondence College of Claptrappe, Oklahoma, had embarked on the search, funded by a $2 million Discovery Institute grant, expecting to remain in the field for at least two years. 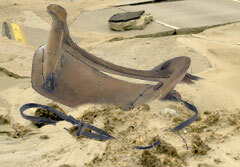 The dinosaur saddle was unearthed a mere two weeks after the expedition's launch. "We were going on the assumption that evidence of man's domestication of certain dinosaurs would have called for large fences, supports for the dinosaur corrals, so that's what we started looking for," said Dr. Booble. "We found a number of poles buried in several feet of sand almost immediately with the help of infrared satellite photos of the area. Then we just started digging, and boom, there it was." The stunning find, a large saddle Dr. Booble believes would have been used by early man in riding "a Velociraptor, or a small Stegosaurus" is in relatively good condition considering its age, which Dr. Booble estimates to be "between 6,000 and 6,500 years". "We haven't yet found any human remains in the area, but that's merely a question of time," said Dr. Booble. According to Dr. Booble and the Discovery Institute, a conservative think-tank based in Seattle with affiliates operating at 1600 Pennsylvania Avenue, Washington, D.C., dinosaurs were expelled from the Garden of Eden for excessive flatulence and "unruly behavior" at about the same time that Adam and Eve were forced to leave as a penalty for a serpent-related "apple conspiracy". Those descendants of Adam who were not captured and eaten by some of the larger carnivores are assumed to have domesticated the less spiky and more manageable species for livestock, along with cows, chickens, goats and pigs. "Based on the shape of the saddle, and this wedge that would slot neatly around the upper spikes of the back, I'm quite confident the saddle was intended to be worn by a Stegosaurus," said Dr. Booble. "Stegosaurus would have proven very useful to early man as a feed animal, and could also have been ridden whenever early horses, who were quite fleet of hoof, could not be captured." Dr. Booble's colleague, Dr. D. Oxy Ribonucleic, offers an alternative view to Dr. Booble's interpretation. "This saddle is far too narrow to fit across the sweeping shoulders of a Stegosaurus," said Dr. Ribonucleic. "It is far more likely that early man used it when riding the much faster and more versatile Velociraptor. Furthermore, we know Velociraptor was a vegetarian, as can be clearly deduced from its long rows of razor-sharp teeth, perfectly designed for tearing leaves from trees or rooting for truffles and other buried delicacies, and could therefore be domesticated at very low risk." Drs. Booble and Ribonucleic hope to exhibit the dinosaur saddle at the prestigious Smithsonian Institution as soon as preliminary lab work and cleansing rites have been performed on the specimen.